When travel to Cuba from the U.S.A. became legal again, we chose to book a cruise from Miami to Havana on the beautiful Norwegian Sky. We enjoyed it so much that we booked a second cruise to Cuba on the Norwegian Sky a few months later so that we could explore more of this beautiful island. This time, we chose to visit the The Vinales Valley - A UNESCO World Heritage Site - and we discovered a Cuban national treasure. We booked an 11 hour tour called "The Vinales Valley - A UNESCO World Heritage Site" and we discovered a Cuban treasure. The Vinales National Park is a Cuban National Monument. More than 90 percent of the property is in the hands of private owners. Thirty percent is owned by individual farmers and another 62 percent is owned by the National Association of Small Farmers. If you want to see the real Cuba, this is the place. Our "The Vinales Valley - A UNESCO World Heritage Site" tour lasted over 11 hours and allowed us to visit the Vinales Valley, the Guyabita Del Pinar Rum Factory, Finca San Vincente for a delicious meal and the Vegueros Cigar Plantation. Vegueros are farmers who make their own cigars. Our tour began with the words, "My name is Hiroshi. And now you are wondering why you have a black guide with a Japanese name speaking English in Cuba. Why? Because that IS Cuba!" Hiroshi explained that Cuba is where all races have gathered and mingled for 500 years. "You are now seeing the Malecon or seawall. In Cuba, it is also known as the world's largest sofa. People come out every evening to sit and socialize," he told us. 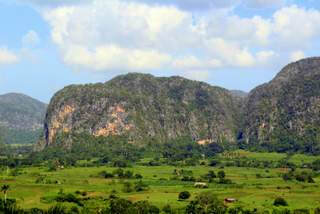 The Vinales Valley is in the Sierra de los Organos on the western end of the island of Cuba. The valley is surrounded by mountains and filled with spectacular limestone domes called mogotes that can rise as high as 1000 feet. The valley has fertile soil. Traditional methods of agriculture for growing tobacco, fruit, vegetables, coffee and raising stock remained nearly unchanged here for several centuries. Whether we were at the top of a mountain or the bottom of the valley, the views were spectacular. Cows, bulls, oxen and horses roam the lush green land near the farmers' homes beside scattered mogotes that rise 1000 feet into the sky. As we drove the rural roads of the western Cuba countryside, we saw new cars, classic cars, horse drawn carriages and farmers plowing their fields with oxen. It is like stepping back in time. Our tour visited the town of Vinales where we had nearly an hour to explore and shop for local art. Vinales is a small town with a town square where locals gather to sip coffee and chat. On our visit, one street was filled with local vendors selling fruits, vegetables, cigars and hand-made souvenirs. The Guyabita Del Pinar Rum Factory produces a local liquor called Guayabita del Pinar. Guayabita means little guava. Pinar del Rio is the region of Cuba where the Guyabita Del Pinar Rum Factory is located. Guayabita del Pinar is a sweet rum made from sugarcane and little guavas. Our tour allowed us to view the process of creating and bottling Guayabita del Pinar. Finca San Vincente is part restaurant, part farm, and part resort in the Vinales Valley. It is a very popular tourist stop. We enjoyed walking the property situated beside a stunning mogotes. People rode horses. Men plowed fields with oxen. Finca San Vincente served us a delicious lunch of roast pork, rice and beans while a talented group of local musicians serenaded us. Some people say that the best cigars in the world come from the province of Pinar del Rio. Our visit to the Vegueros Cigar Plantation gave us a close-up view of rural Cuban life and the opportunity to sample these world famous cigars. The owner of the plantation greeted us with a smile and walked us through his tobacco operation, his farm and his home. We watched as his children came home from school in their immaculate school uniforms which indicate their grade level. We were offered samples of rum and cigars. Though the tobacco and cigar creation used ancient methods and their home was small, the farmer and his family seemed perfectly content to be living in their country paradise. The Norwegian Sky docked in Havana. We got through Customs and stepped out of the port terminal right into the Old Colonial District. Old Havana is everything we expected and more - churches turned into museums, Baroque facades, colonial cobblestone streets, wooden brick streets, fortresses, Spanish architecture, pastel-colored homes, laundry hanging from balconies, statues and classic 1950’s era automobiles. And…the Norwegian Sky stays in Havana overnight allowing guests a day and a half to sightsee. For more than half a century, Norwegian Cruise Line has offered more than just the traditional cruising experience. Their Freestyle Cruising revolutionized the industry by giving guests the freedom and flexibility to design a cruise vacation that meets their own needs and schedules - no fixed dining times, relaxed attire, multiple dining options, relaxed disembarkation, and more lounges, bars, theaters and entertainment and activity options. There is always an event taking place or a meal being offered and you can choose whatever fits you best. Our cruise offered all-inclusive beverages. Whether we wanted a soda, a beer or a cocktail, there was never an additional charge. The staff and crew are well trained, friendly and helpful. It is no surprise to see guests tearfully hugging the employees on disembarkation day. 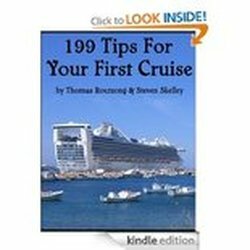 Norwegian Cruise Line holds a unique place in the cruise industry. High quality service, delicious food, affordable all-inclusive packages and Freestyle Cruising make cruising Norwegian a pleasure. Gay travelers should also remember to join the LGBT get-togethers onboard the Sky.